The over-arching goal of VCOP Mobile is to bring spay-neuter services to rural municipal shelters in North Florida that currently have no or extremely limited access to veterinary care. VCOP Mobile works within the existing clinical elective to provide veterinary students with an additional opportunity for hands-on surgical training while ensuring their exposure to the mobile spay-neuter clinic model. 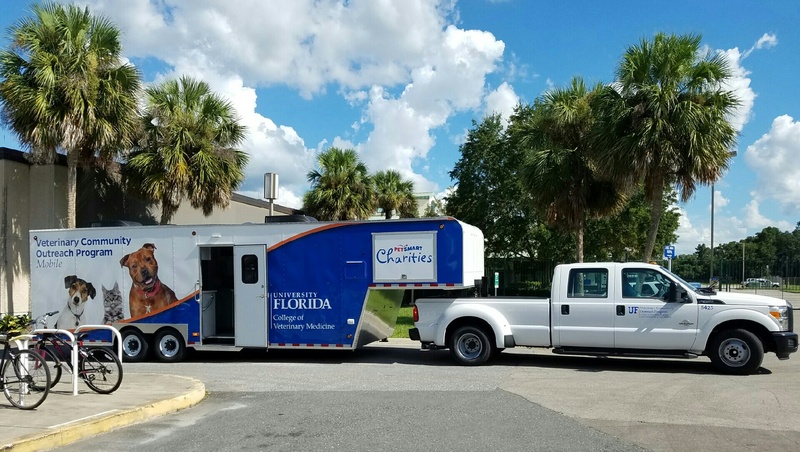 The program allows for the expansion of the current spay-neuter and medical services of the UF Veterinary Community Outreach Program to additional regional sheltering organizations and has the potential to provide veterinary care to thousands of shelter animals each year. Through grants and private donations, we seek to provide our services at no cost to the recipient organizations. The purchase of our customized, mobile spay-neuter trailer was funded by a generous grant from PetSmart Charities, Inc. Ongoing operational costs rely solely on private donations and additional granting opportunities. It costs an average of $100,000 per year to operate VCOP Mobile full time. Please make checks payable to “UF Foundation” and write “VCOP Mobile” in the memo line.